Dads are famously difficult to shop for but we’ve got you covered! 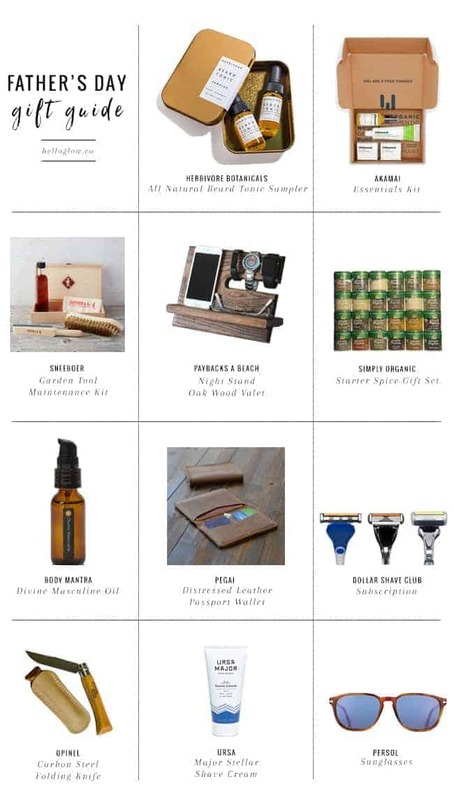 This year, we’re keeping it simple and practical with 11 Father’s Day gifts every guy will love. When in doubt, just add a 6 pack of his favorite beer! 1. Herbivore Botanicals All Natural Beard Tonic Sampler // This tonic combines natural plant oils that promote a healthier looking beard while moisturizing the skin underneath. 2. Akamai Essentials Kit // Everything he needs for clean and healthy teeth, skin and hair–no more, no less. 3. Sneeboer Garden Tool Maintenance Kit // For the handy dad who likes gardening, this tool maintenance kit will be highly appreciated. 4. Night Stand Oak Wood Valet // Now he can keep all his essentials in one place on an elegant handcrafted valet made from solid oak. 5. Ultimate Organic Starter Spice Gift Set // This spice kit from Simply Organic is everything he needs to grill the perfect BBQ or cook his famous stew. 6. BodyMantra Divine Masculine // Body Mantra oils are handcrafted with directed intention so that he’ll receive both medicinal and energetic benefits when using it. 7. Distressed Leather Passport Wallet // A handmade leather wallet he’ll be using for years to come, with several pockets perfect for organization. 8. Dollar Shave Club Subscription // The gift that keeps on giving: get a monthly box of fresh razors for up to 12 months. 9. Opinel Carbon Steel Folding Knife // An essential for every guy, this Opinel folding knife comes with a handy leather pouch which makes it easy to carry. 10. Ursa Major Stellar Shave Cream // Super-concentrated, non-lathering shave cream which minimizes nicks and leaves the skin smooth and soft. 11. Persol Sunglasses // He will feel like Steve McQueen whenever he wears these sunglasses–and that will probably be all the time! If you’re on a budget or feeling crafty, be sure to check out our list of 100 handmade gifts for dad too.